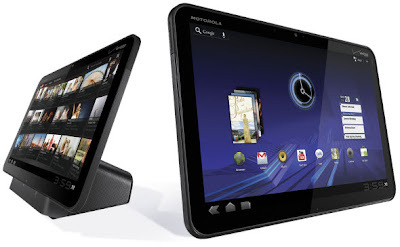 Earlier this year, Motorola announced its first tablet device, the Motorola Xoom. It is the first tablet powered by the Android 3.0 (Honeycomb) Operating System. Last month, Motorola released the Wi-Fi only version of this amazing tablet on Verizon. And now, Sprint joined the bandwagon and announced the Motorola Xoom Wi-Fi for its customers in the US. This device will be available from Sprint beginning on Sunday, May 8th. Motorola Xoom Wi-Fi features with a 10.1 inch touchscreen display, 1280 x 800 pixels resolution, Android 3.0 (Honeycomb) OS, 1GHz NVIDIA Tegra 2 dual-core processor, 5 megapixel rear camera with dual LED flash, 2 megapixel front-facing camera, Google Chrome bookmark sync and incognito mode, Android Market and more. Other features include a 3.5mm headset jack, HD (720p) video recording, Full HD (1080p) playback, micro USB 2.0, Corporate Sync, Wi-Fi, Bluetooth 2.1 + EDR + HID, 32GB internal memory, SD card support, 1GB DDR2 RAM, Integrated GPS, up to 10 hour video playback and a 3250 mAh Lithium-ion battery. Motorola Xoom Wi-Fi comes with a price tag of $599.99 without any contract. This device will be available through Sprint Stores, Web sales, Telesales and Sprint Business Sales from May 8th. Motorola Xoom Wi-Fi allows you to read more than 3 million Google eBooks and access more than 150,000 useful applications, widgets and games from the Android Market.